To determine the problems with your citations, we need to perform a full citation audit to track all existing instances. This guide is what our team for Loganix uses, and we have great results. This is a combined manual and automated audit, to ensure we track all possible existing citations. Spreadsheet – Prepare a spreadsheet, it could be an excel sheet, a google spreadsheet or whatever you prefer as long as you can find it easy and accessible. We prefer using Google Spreadsheet because we can easily share them with our clients and multiple people can collaborate at once. Here is a sample report template we have https://docs.google.com/spreadsheets/d/1cdv5yIdxcu8kddGyzHzkGJOLefOeO62lN1kkxwpcutY/edit#gid=684413488. Make sure to include a client intake form to get the needed information. NAP Hunter – This free tool from Andrew Shotland helped us spin our NAP variations. It also save you from missing any NAP combination during google search. You can download an extension to your chrome browser here. Scraper (or Good ‘Ol Fashion Elbow Grease) – We built our own scraper using macro codes (unfortunately this is not available to public). 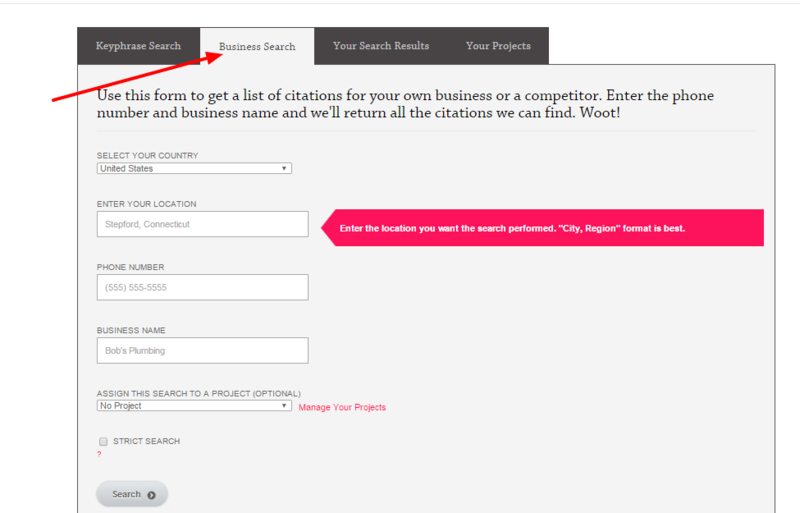 You can use Whitespark LCF or BrightLocal Citation Tracker. In this demonstration, we will be emphasizing doing things the old fashioned way, as we want the fullest picture possible. We will demo how to use LCF or BL’s tool, but only as means of making twice certain that we didn’t leave a single citation behind, important or otherwise. If they are indexed in Google, we will find them. You need to collect all important data about the business and record it on a spreadsheet. 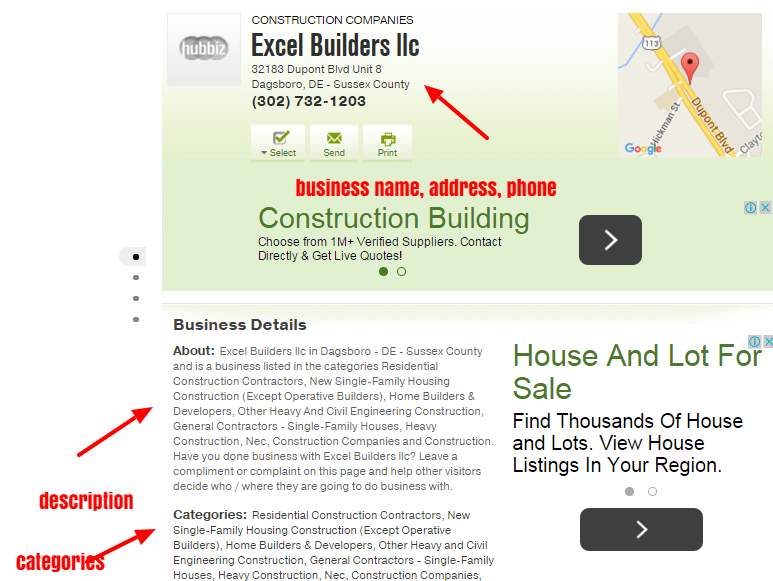 We need to identify the current/correct business name, address, local phone # and website. We also need to know if the business has another location active or not. Has the business moved from one location to another, been rebranded or changed phone? We need to know this information in preparation for the audit that will take place. All of this information will help us categorize every NAP variations we might found during the audit. We also need to find out if the business uses other data provider services such as data aggregators like yext, mozlocal, UBL and other similar services. These data providers automatically build citations to a number of sites. If we’re aware that the business uses any of these services, it can give us an idea on which sites the business is already submitted. 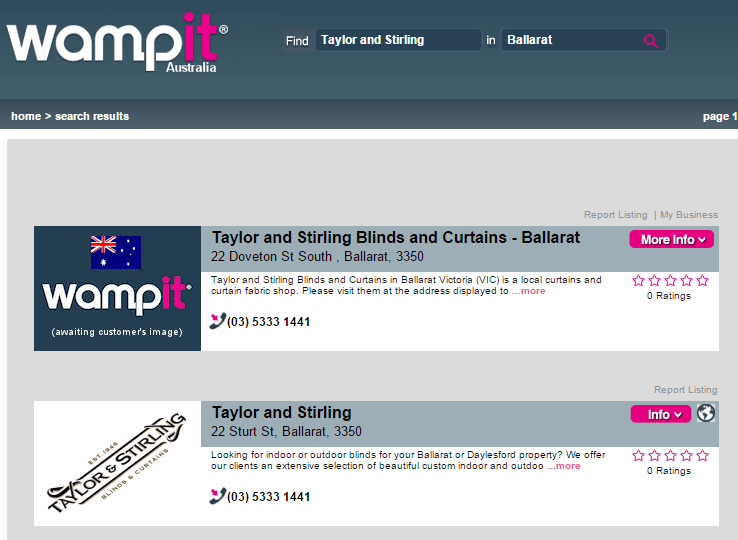 Check our sample client intake form here. 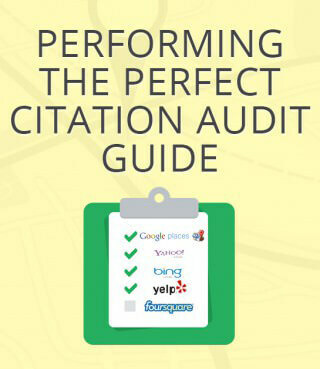 The more information you get, the better the results of the citation audit. We usually collect NAP variations during the citation audit. Every time we find a different name, address or phone # that the business used, we note it on our spreadsheets and will use them for searching existing citations. In some cases, the business owners are aware of the old business info, which they will provide during data gathering. Some Won’t know. 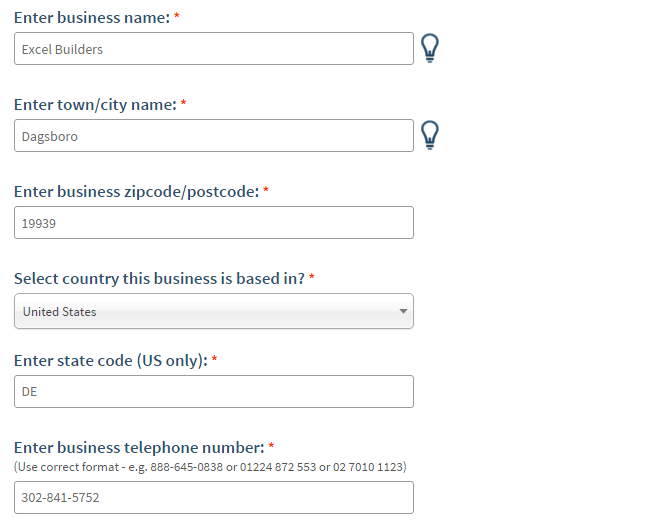 Enter your business name and part of the address and click search. Click the “Details” and then click “History”. You can view how many times this business has been edited. This is an interesting tip from Phil Rozek. He found out that old business info often can be hosted on bbb.org. Here is the link to the article. 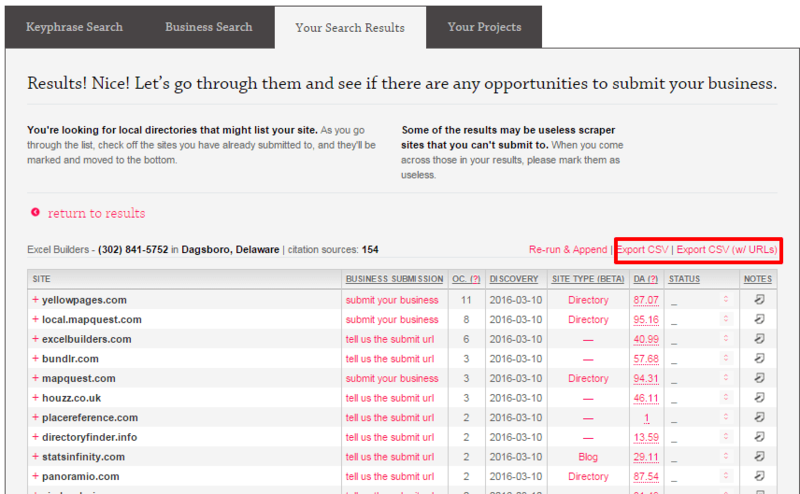 Interesting info from Darren Shaw’s WBF: When two sites don’t merge business profiles and instead create duplicate profiles, we can use these site to search for old business info. Just go to the site and use the site search. 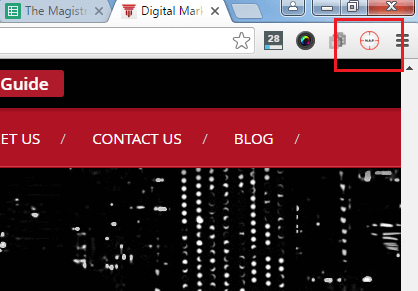 Open your chrome browser and click the NAP hunter icon. Enter NAP variations one at a time. So for the starter, let’s use the current correct business info. Enter the business name, street address, suite # (if present) and the phone #. Click the “Hunt” button. Notice that it will open up several tabs in your browser. Note: It is best not to include the complete address. Try a different query like adding only some portion of your address. 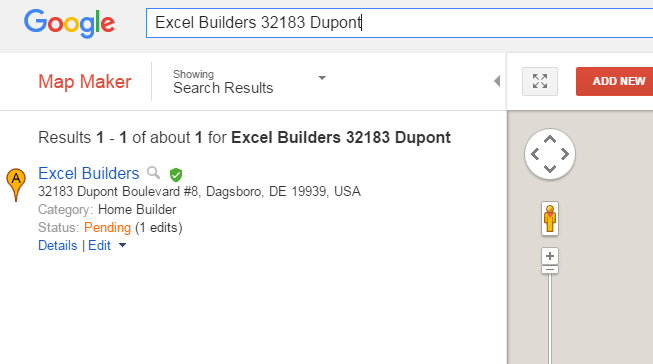 example “32183 Dupont” or “Dagsboro, DE”. What NAP Hunter does is to automate search queries using the NAP that you provided. 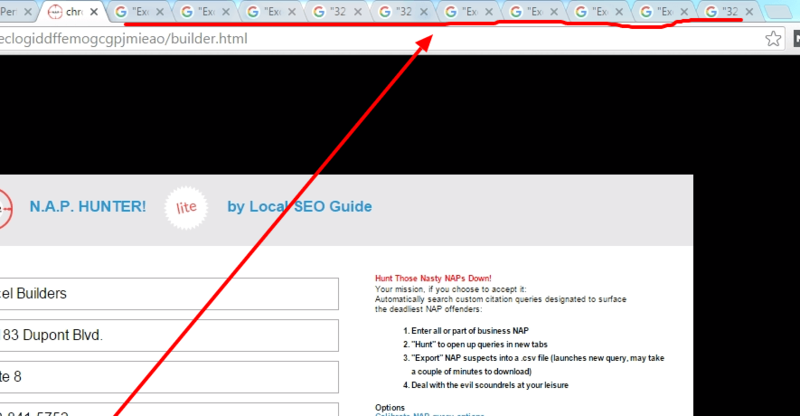 One tab is for one google search query. Note: Don’t make too many searches via NAP Hunter in a short period of time. Google may detect that you are using an automated tool to do the searches and might block you from using Google search for a few hours. Stick to 3-5 searches per minute. Check each tab and visit every link. 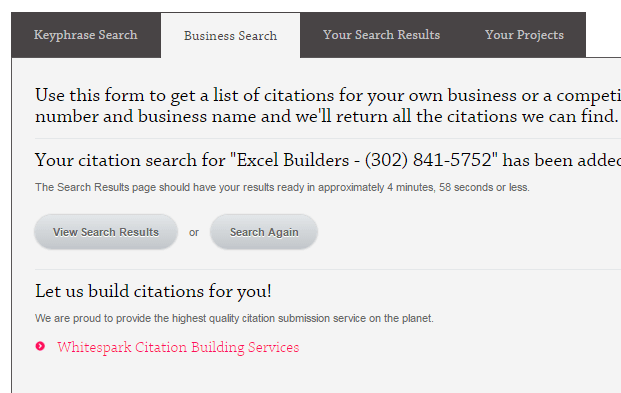 Check if the link directs you to the citations for your business. Check for the business info and record it to the spreadsheet. If it matched your business NAP record, it is correct. If it doesn’t, check the incorrect business info and note it on your report. 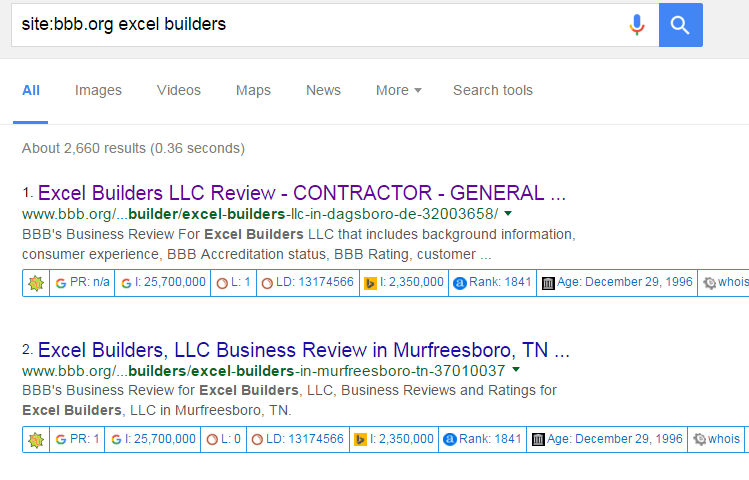 Some search results are not related to your business. Make sure to match it to your current business info or previous business info. If it does not match either one, don’t bother to include that to your report. Do not stop after checking the business NAP on one specific citation profile. 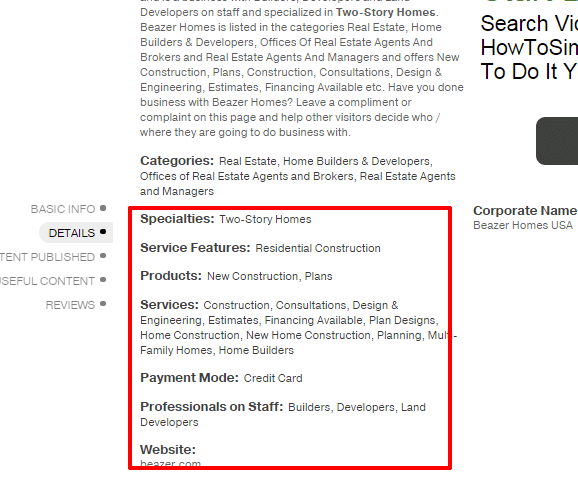 Check other information such as website link, category, business hours and other details. Check the image below where I also point out other business info. I found some of the info was missing, but since I we don’t know if that website allows us to enter more business information, we need to open another business profile in order to verify. Below we see that it is possible to include website links, payment modes, services and etc. I added a remarks on my audit report, suggesting to my client that it is possible to add more business details on that citation profile. Note: Some sites allow us to include limited business information on “FREE” accounts, meaning you have to upgrade in order to display more details about your business. Paying probably isn’t necessary in most cases. Just leave your profile as it is. Check the next tab once done, and make sure not to visit the same link again. The link you visited will automatically change the font color from blue to purple, indicating you’ve already visited that link. This will save you so much time in your audit. Make sure to record every new NAP variation that you found during the audit. Every NAP variation will be used as search query using NAP Hunter. Once you’ve finished checking all the links on all the tabs, run another NAP Hunter using the next variation. Remember, the number of times you run the NAP hunter is based on the number of NAP variation you found. if, every time, you found different NAP variation, it is subject to the audit and should br run through NAP Hunter. This way we can track all possible existing citations. Also remember, if the citation is not indexed (Google hasn’t found it and stored it in their search results), then you won’t find it this way. This is why when we conduct a citation building campaign, regardless of the findings in our very thorough citation audit, we perfect a search using the directories’ search function to be sure they aren’t yet submitted. Most data provider services support US businesses and might not be available for other countries. This includes US aggregators such as Neustar Localeze, Acxiom, InfoGroup and Factual. Other data providers are UBL, Yext and MozLocal. It is best to do audits on these site because they distribute business info to other sites. 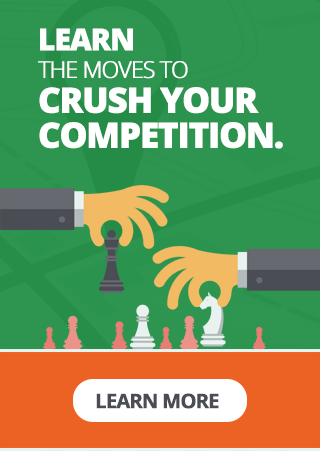 To better understand where these data provider send business data, here’s an article from moz. If you will be cleaning up all inconsistencies after the audit, make sure to start with these data provider. If not, no matter how many times you try to edit the incorrect business info on one specific site, it will revert to the same business status it had before you fixed it. 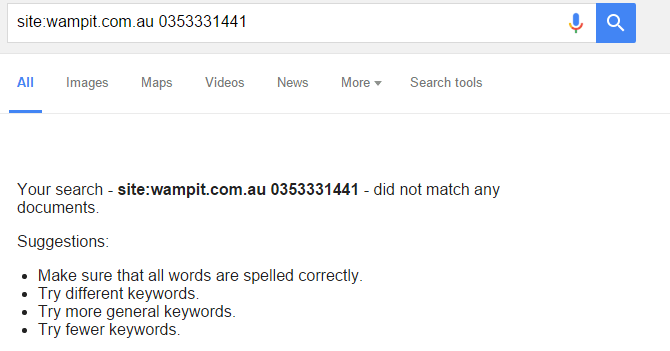 This is because the source (which is the data provider) is still sending incorrect business info to that site. 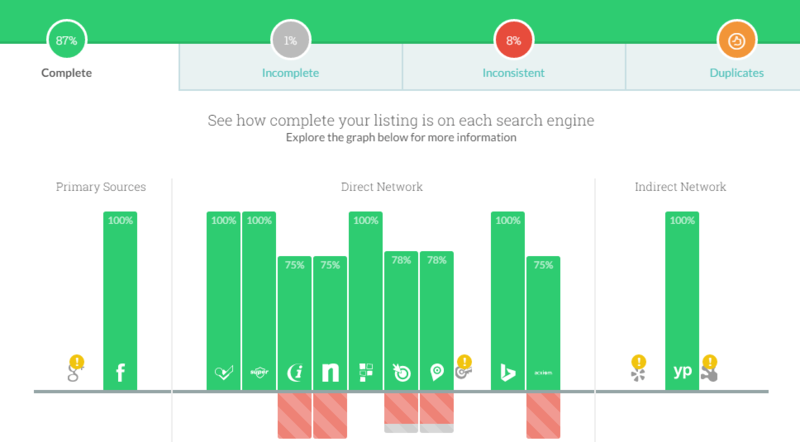 You need to do a site search to check if your business is present on these data providers, because they may not appear on Google search results. Below are some quick steps on how to do it for specific website. 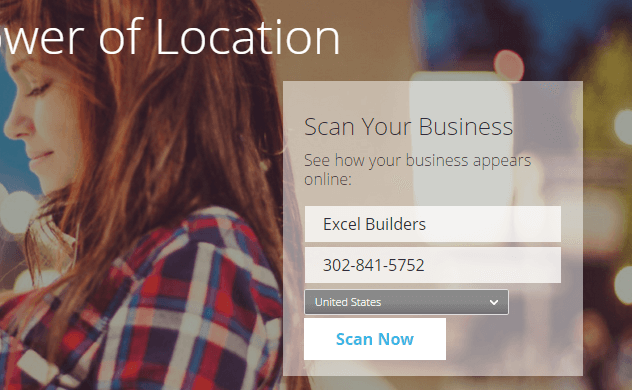 Go to this link https://www.neustarlocaleze.biz/manage/cart/addClick “search” and enter your business information. Then click the “search” button. If no business profile is present, you are free to add a new business (unfortunately this is not free). 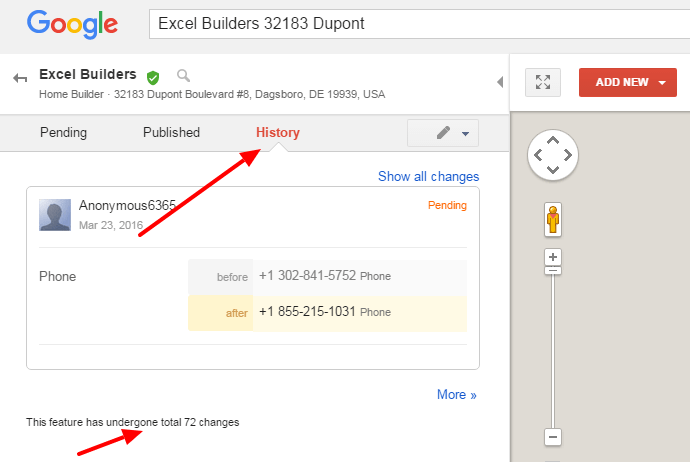 If you found an existing business profile, record it on your spreadsheet. Fill up the form to find out if your business exists. Go to http://www.yext.com/ and enter your business info. Then click “Scan Now” button. Visit every link and check for the business info. Audit every citation from YEXT and record it to your spreadsheet. 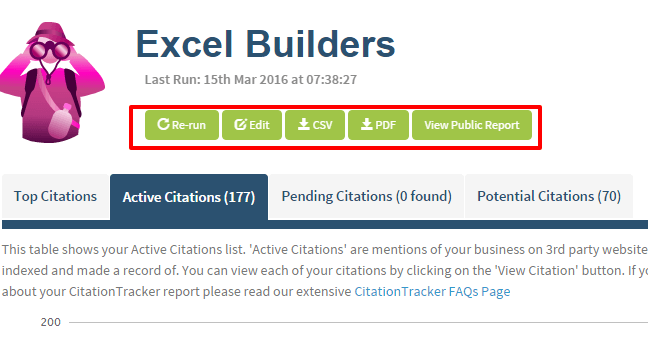 Recording those citations from YEXT to the spreadsheet is based on the profile status. 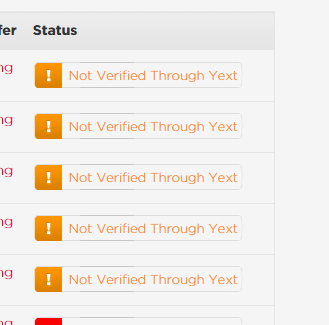 For “Not Verified Through Yext” we just includes it on our manual audit because YEXT does not control these citations. 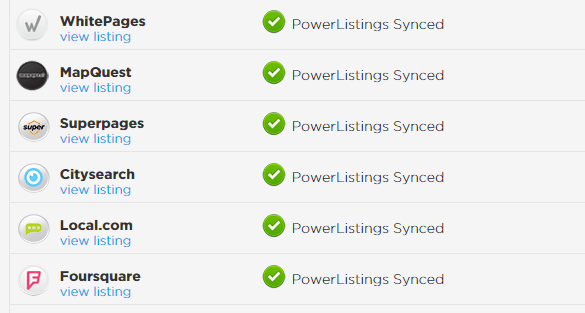 For “PowerListings Synced” We sort it as such because to prepare it for the cleanup. YEXT has control over those citations and the only way you can fix it is via YEXT dashboard. Moz Local Search will help you to check if your business is listed on top citation sites, and especially the top aggregators. 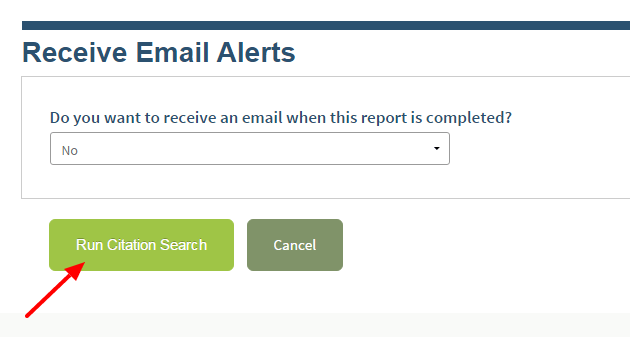 You won’t have to do s manual aggregator check. It will also give you an idea of the current status of each profile. To search, just login to your Moz account. 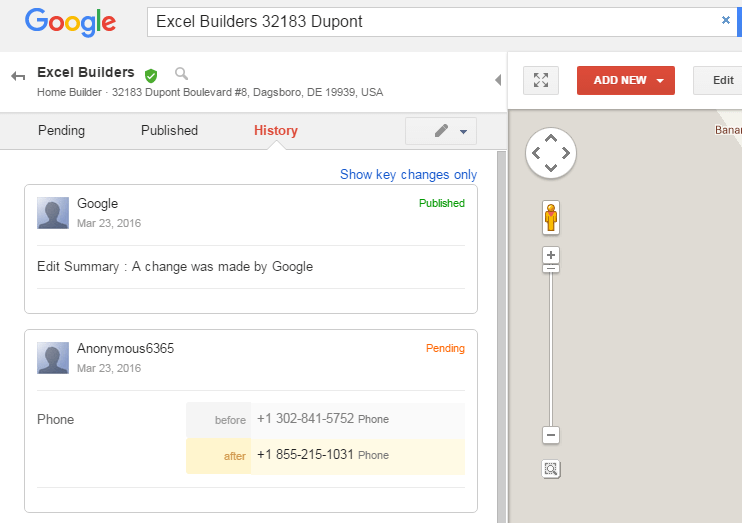 Now you can view the current status of your business profile, and where it is listed. Note: Remember if you have multiple NAP variations, be sure to use them and check those data provider sites. To make sure that we track every possible existing citation, we use our own automated scraper. We do this after a manual audit to check if there are citations that we missed so they can be included in our audit. 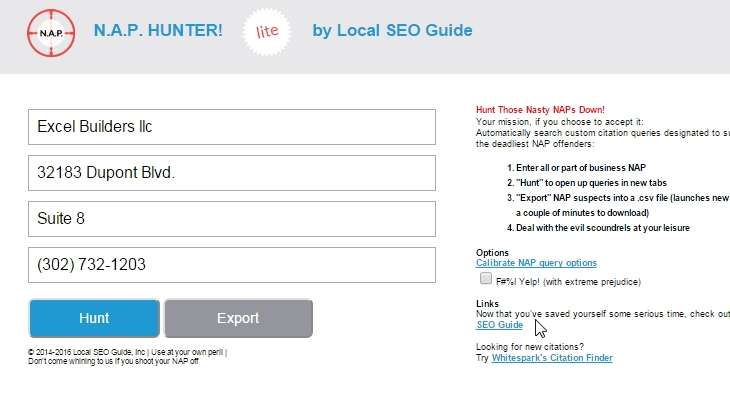 You can check Whitespark Local Citation Finder or BrightLocal Citation Tracker if you want to automate your our citation audit. Please note that neither tools is built to find every citation, but instead to deliver only results that these tools builders deem important, without overloading you with data. To get a truly full view of your citations, it is recommended that you do a manual search yourself, in Google, as we have demonstrated. Go to http://www.whitespark.ca/ and login to your whitespark account. You can now view all citation found by whitespark. You can get a csv copy by click “Export” links. Go to https://www.brightlocal.com/ and login to your account. Enter all required business info. Once completed, it will display the # of active location your business has and potential citation sources you can use if you’ll be doing citation building in the future. 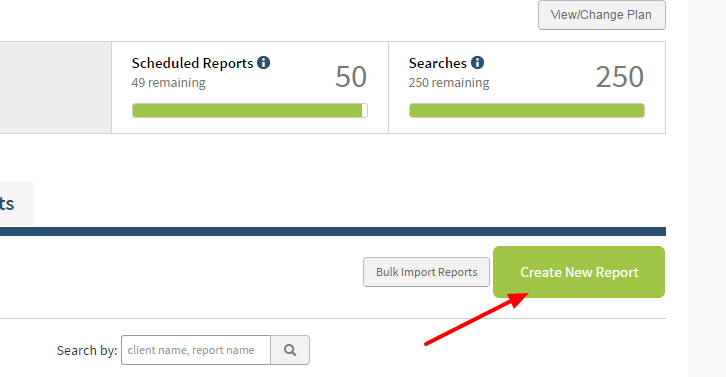 You can also export a report to type that works for you. This process is usually performed during the actual citation building campaign, because it will take forever to do a site search for all citation sources. 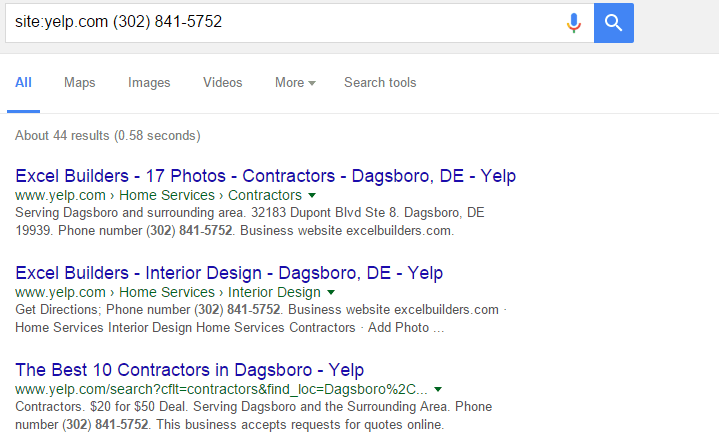 Whenever we want to list a business on a specific sites, we do a site search before we add the business. Not all citations have been indexed by search engines, especially if those profiles are new or the citation site has blocked search engines from scraping its website. Note: Our categorization of the citation is based on the business NAP. If ever a citation has incorrect business info except the NAP, we add a note to remarks. It is like giving our client a recommendation on what needs to be done in a specific citation. #1 Matched all business NAP? #2 The business name, address or phone is incorrect? #3 None of NAP matched? If it did not match any business info (current or previous) then it is likely not worth it to include in your audit. #4 Slight error on business name, address and phone format? Address and phone format might be different for other sites or other country. Make sure to check other business profiles listed on that site. #5 Existing citation used a toll free phone or other active phone instead of main local phone? We do not label them as incorrect, but we make sure that we sort it from the others and add a remark that it uses another active phone. So that if the client want to modify the phone it would be pretty easy to determine which citations need to dealt with. 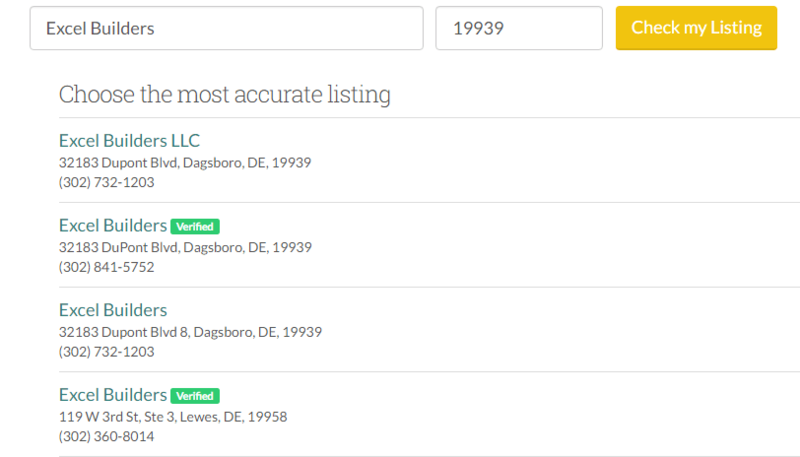 If we find duplicate profiles, we choose the best one based on factors like if that citation has a great amount of good review versus to none, or the other has complete business info. For business categories like legal, real estate and doctors, it is ok to have a citation for the brand and a citation for each professional under that business. #7 Business shares the same address? Often you encounter this for businesses inside a mall or a building, but as long as it is a completely different business from yours and you don’t share the same phone, this will not cause any problems. There are no such thing as perfect audit. As I earlier explained, if they are not indexed, you won’t see them. The spread of bad info can be maddening. Even if you kept a record of your existing citations, some site may scrape your info and create a citation without your awareness. You need to stay on top of it. We always recommend running a quarterly citation audit. You will sleep better knowing your citations aren’t being copied and manipulated.